Check out these expertly crafted spirits from local New Mexican distilleries. Above: Aging barrels at Santa Fe Spirits. Photograph by Douglas Merriam. SITTING UNDER A PORTAL with a cocktail in hand, I watch a monsoon roll in. The dust kicks up, and high-desert aromas roll in off the mesa—earthy juniper, herbaceous sage, fruity lavender. Coincidentally, those same aromas waft from my mason jar, which holds a concoction made from Ginebra, a Southwestern dry gin from Algodones Distillery, one of a handful of craft spirit makers that are helping to propel New Mexico’s cocktail scene to delicious new heights. For years, New Mexico has ridden the craft brewery wave, and now next-gen makers are aiming for the same success in spirits. There’s good reason to tip in: Nationally, craft spirit makers sold some six million cases in 2016—nearly 20 percent more than the previous year, according to the American Craft Spirits Association. The movement has already attracted many of the liquid innovators who had been brewing beer. 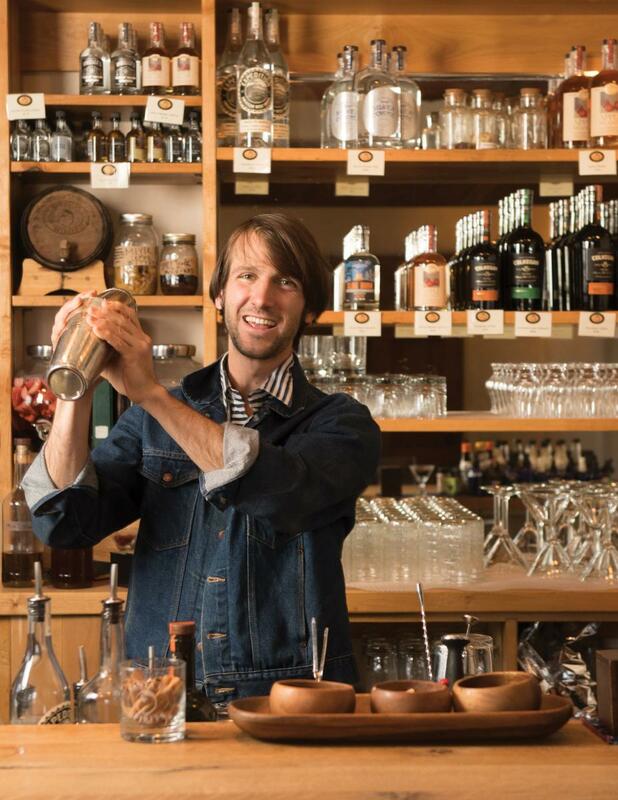 Matt Simonds, owner of Albuquerque’s Broken Trail Spirits + Brew, believes the industry is about to boom. “We’re seeing a customer base that enjoys craft products that don’t come from a factory,” he says. 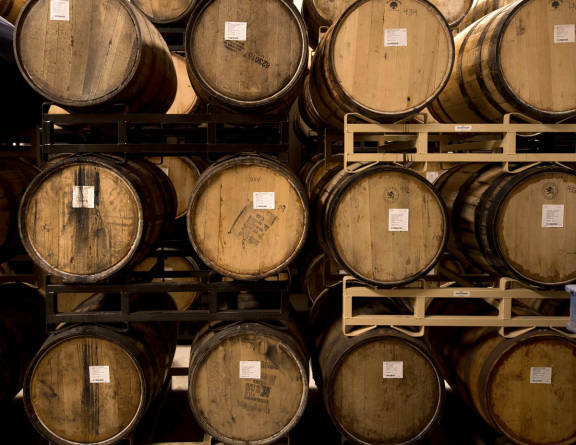 “People like shaking hands with the brewer that made their beer, and they want that same intimacy with spirits.” Already there are three distilleries in Albuquerque, and several more in the startup phase. This new energy powering New Mexico’s distillers means they’re experimenting gleefully with a broad palette of ingredients and styles. The fact that they have yet to coalesce into a single New Mexican specialty means we get to sip the benefits of their creativity. Gin is emerging as an obvious choice, since New Mexico’s landscapes are strewn with juniper trees and the berries are readily available. But our state’s abundance of other flavors, from piñon to peppers, lend themselves to a bounty of only–in–New Mexico notes. Mix a burgeoning industry with the artisanal trend, and garnish with universally applauded craft distillery laws that make it easier to open tasting rooms in New Mexico, and you’ve got a whole new way to imbibe. Since opening its brewery in 1997, Three Rivers has become a Farmington institution, filling downtown’s 1912 Andrews Building and an entire block along Main Street with a pizza parlor and event space. The company’s historic digs restricted a brewery expansion, so the owners decided to turn to spirits for their new venture. They installed a still and carved out a lounge from the banquet hall. The renamed Three Rivers Brewstillery has developed a wide-ranging spirit and cocktail menu. With a nod to our state’s signature cocktail, the margarita, Three Rivers recently released its Tierra del Encanta, an agave spirit that packs all the flavor of tequila (even if it can’t use the marquee name, since tequila, an agave-based spirit, can be called tequila only if it originates in Mexico). Three Rivers distills the spirit here but sources its agave from Mexico to give Tierra del Encanta authenticity. Sip This: Its flagship line includes Entropy Vodka, Blackstrap Rum, and Gladys Gin, the last one named for the ghost said to haunt the 100-year-old restaurant building. Since barrel-aged whiskey takes years to make—that’s how whiskey gets its caramel color and rich flavor—Three Rivers currently serves a clear, unaged version that it calls hooch, also known as moonshine. Popular seasonal cocktails include the Jalisco DL—with the Tierra del Encanta, lime, and coconut—and the Kickin’ Up Dust, a bright whiskey libation that’s a good summer sip. Visit: Tours available on request (109 E. Main St., Farmington, 505-324-2187, threeriversbrewery.com). Sip This: Broken Trail’s gin varies from the traditional dry London gin; it’s distilled with locally harvested prickly pear and neomexicanus hops (the state’s indigenous hops variety) to infuse the spirit with a distinctly New Mexican flavor. 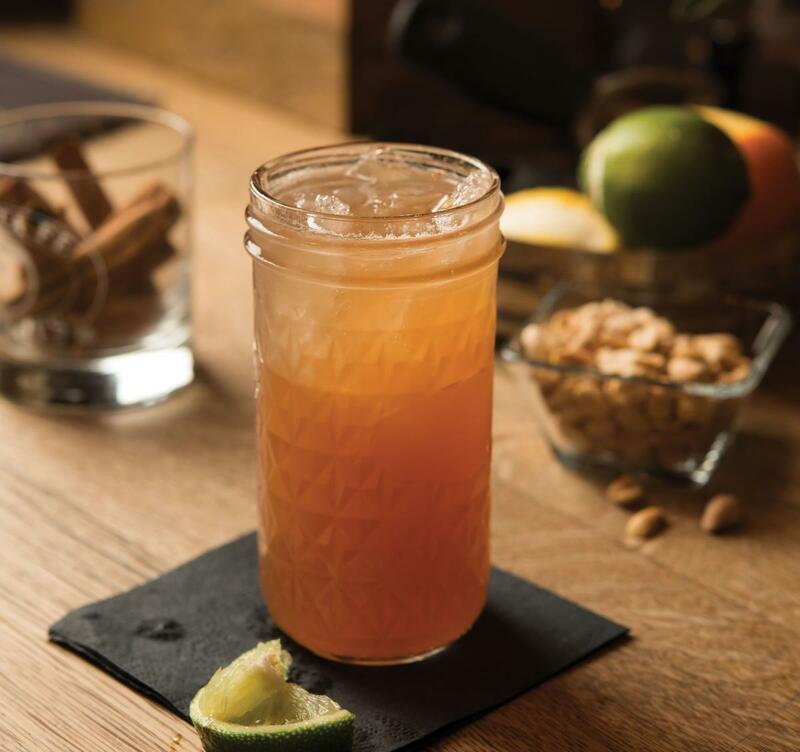 The corn-based Holy Ghost Vodka (named after a Pecos Mountains creek where Simonds likes to fish) is popular in a cocktail incarnation called Pepe the Mule, the distillery’s take on a Moscow mule. Visit: Tours available by appointment at the Green Jeans Tasting Room (3600 Cutler Ave. NE), Broken Trail distillery and brewery (2921 Stanford Dr. NE), and Broken Trail Uptown Tasting Room (6902 Menaul Blvd. NE, 505-221-6281, brokentrailspirits.com). Above: Santa Fe Spirits. Photograph by Douglas Merriam. Englishman Colin Keegan embraces local ingredients to give his spirits a distinct Land of Enchantment taste. The most terroir-forward spirit is the Atapiño Liqueur, which, to his knowledge, is the world’s only piñon liqueur. Harvested from the Santa Fe National Forest, the nuts are roasted and infused into the liqueur. It’s then barrel-aged and sweetened with ponderosa pine sap. “When you drink it, you really feel like you’re hiking in the woods on a fall day,” says national sales manager Jimmy McCabe. Keegan also gathers ingredients from his own backyard. He and his wife bought the former home of Archbishop Lamy’s grounds-keeper (a property rich in New Mexico history), and it came with a centuries-old fruit orchard. The juice from those apples—and others—is fermented and distilled into the Santa Fe Spirits Apple Brandy. Cocktails at the company’s Santa Fe tasting room are the pinnacle of the craft experience, often concocted with house-made bitters, syrups, shrubs, infusions, and even its own tonic water. Sip This: The Wheeler’s Gin is a spirit rich with New Mexico botanicals such as cholla blossom, osha root, and juniper. The cholla gives it cucumber and hibiscus notes, while the osha lends an earthy flavor. The gin goes into the spirit maker’s Sage Collins, a New Mexican twist on the Tom Collins. Visit: Distillery tours are available at 1, 3, and 5 p.m. on Thursdays, Fridays, and Saturdays—reservations required (7501 Mallard Way, Unit 1, Santa Fe, 505-467-8892). Book a class there to learn how to stir, shake, muddle, and even spank (yes, spank) as you craft your own cocktails, or visit the tasting room (308 Read St., Santa Fe, 505-780-5906, santafespirits.com). Above: Algodones Distillery. Photograph by Douglas Merriam. 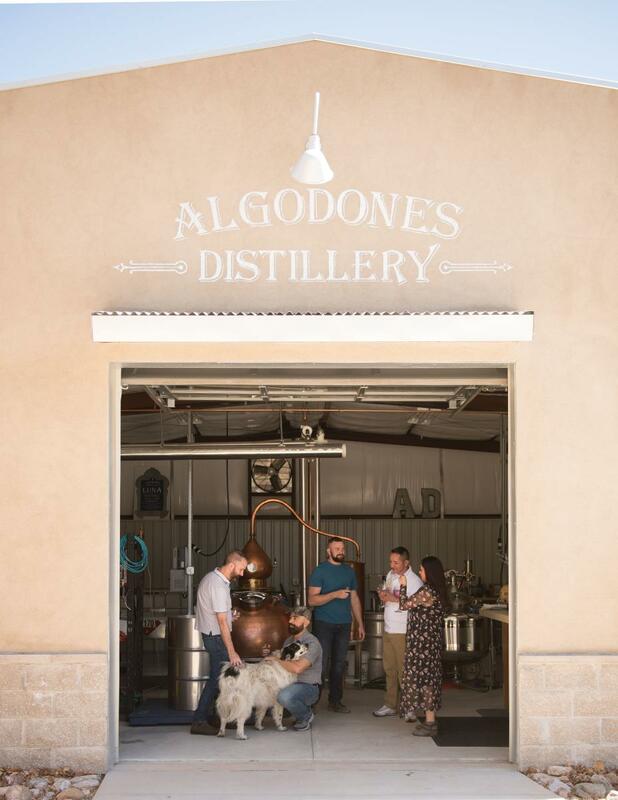 Named for its town of origin, Algodones Distillery shares the local ethos. “We wanted to see what we could do to highlight the effects of agriculture, water, and climate on spirits,” says owner Greg McAllister. Its Ginebra Southwest Dry Gin incorporates six New Mexico botanicals for a Western-style gin that mixes a traditional juniper flavor with strong notes of lavender, desert sage, rose, and prickly pear. Algodones Distillery is also developing a blue corn whiskey that it plans to debut this year. The blue corn, which comes from a San Jon farm, near Tucumcari, infuses the whiskey with a roasted, rather than fruity, flavor. “It’s something of an acquired taste, but it’s very pleasant and really does taste like you’re drinking blue corn,” McAllister says. He hopes to expand the distillery’s specialty flavors, which have a New Mexico bent: Think piñon, honey, and pecan. Sip This: The Claro Clear Diamond Vodka is exceptionally pure and great in cocktails, such as the distillery’s Sandia Martini, a watermelon twist on the classic. Visit: Tours offered 2–4 p.m. Saturdays (15 Calle Alfredo, Algodones, 505-301-9992, algodonesdistillery.com). Willis Ponder, who operates Sacred Grounds Coffee and Tea House, in Ruidoso, began distilling with his son in a barn in Austin, Texas. So it seemed fitting that when friends and now partners Glen and Sherry Barrow had a historic barn available in Glenrio, Ponder and the Barrows jumped at the chance to set up a distillery and tasting room. Drawing on their coffeehouse roots, they started with a coffee liqueur. But they’re expanding their offerings in a manner similar to many craft distillers: by taking existing products and conditioning them. For example, their GlenWillis Aquila is an agave spirit smoked with mesquite and aged in wine barrels. They’re treating vodka and gin similarly as their own whiskey begins fermenting. Sip This: Glencoe’s GlenWillis Gin is a perfect base for its gimlet, an herbaceous twist on the classic, with basil leaves, rosemary, and agave sap. The cocktail is available at the distillery and in the Ruidoso tasting room. Visit: The distillery (27489 US 70, Glencoe) or the distillery and brewery at Sacred Grounds Coffee and Tea House (2704 Sudderth Dr., Ruidoso, 575-257-2273, on Facebook). Located across the street from Marble Brewery’s original downtown Albuquerque location, Still Spirits found success by keeping its focus on cocktails in this beer-forward neighborhood. Co-owners Zachary Hulme and Peter Arathoon redistill a premade vodka to give it a neutral flavor suitable for mixing. With just two spirits on its menu—vodka and gin—Hulme says they get extra-creative with infusions and syrups. For example, one of Still Spirits’ most popular mixed drinks, the Contiki, features pineapple vodka, orgeat (a syrup made from almonds, sugar, and rose water or orange flower water), a splash of bitters, and soda water. “If you’re going to live the life of the craft cocktail, you do as much as you can,” Hulme says. That extends to making their own tonic water by simmering cinchona bark, lemongrass, ginger, citrus, and coriander and then adding soda water. Sip This: Still Spirits’ other crowd-pleasing cocktails include the Red No. 4, with hibiscus-infused vodka, ginger beer, soda water, and splashes of simple syrup and lime juice, as well as its bloody Mary, which is garnished with pickled okra from a local farm. Visit: Tours available by request (120 Marble Ave. NW, Albuquerque, 505-750-3138, on Facebook). Mix all ingredients in a Collins glass. Top with ginger beer. Garnish with lime. In a cocktail shaker, add all ingredients. Shake vigorously with ice and strain into martini glass. Top gently with 3 drops of Angostura bitters and draw hearts in the foam. Inspired by a Spanish gin bar, this twist on a traditional gin and tonic enhances the flavors of the gin with the botanicals used to create it. Squeeze juice from the lime into a balloon wine goblet filled with ice. Add gin. Top with tonic water (to taste). Garnish with a twist of lime, juniper berries, lavender flowers, and prickly pear juice. Pour rum, lime, and simple syrup over ice. Stir and top with soda to taste. Check out its distillery and tasting room (236 Rio Bravo, Los Alamos) or its distillery and wine room (18057-A US 84/285, Santa Fe, 505-695-0817, dqdistillery.com). Tours available by request (2924 Girard Blvd. NE, Albuquerque, 505-508-0508, leftturndistilling.com). Visit its tasting room (203 S. Mill Road, Silver City) or its brewery and distillery (200 N. Bullard, Silver City, 575-956-6144, littletoadcreek.com). A satellite tasting room is now open in Las Cruces (119 N. Main St., 575-556-9934). Visitors are welcome at the distillery (32 Bisbee Ct., Santa Fe) and tasting room (2797 Agua Fria St., Santa Fe, 505-303-3808, tumblerootbreweryanddistillery.com). Hollow Spirits is slated to open in Albuquerque this summer. It plans on sourcing New Mexico corn for its bourbon and will use New Mexico products—chocolate, chile, and lavender—for its infusions (1324 First St. NW, Albuquerque, 505-433-2766, hollowspirits.com).